Another SQLBits – the fifth! – has come and gone, and I wanted to say thanks to everyone that helped to make it such a success. It was a three-day event for the first time this time, which meant that there was even more organisation work needed, but looking back I think it all went extremely smoothly and was by far the slickest conference we’ve put on so far. My colleagues on the organising committee, Simon Sabin, Martin Bell, Allan Mitchell, Darren Green and James Rowland-Jones, are a great bunch of people and it’s always a pleasure to work with them on SQLBits even if it does take a big chunk out of our spare time. Thanks are also due to the speakers and sponsors, without whom the event would not be possible, and I’d also like to highlight the people who volunteered to help out doing unglamorous things like stuffing the attendee bags and room monitoring – Rachel Clements, Jon Reade, Gary Short, Rachel Hawley, Richard Douglas, Luke Hayler and many others. If you came to SQLBits I hope you enjoyed it, and if you did enjoy it please let everyone know by blogging and twittering about it. Please also join the SQLBits groups on LinkedIn and Facebook, and if you’ve got any pictures of the event why not post them on the latter? Anyway, it’s time to crack on with some real work and deal with the big pile of emails that has built up over the last few weeks. I’ve missed a whole bunch of big announcements I would otherwise have blogged about but I’m sure you’ve caught them elsewhere… I must get round to downloading and installing the latest Powerpivot CTP etc. See you at the next SQLBits! Interesting news from PDC: Microsoft has announced two new services – Pinpoint and Dallas. Pinpoint is the fast, easy way for business customers to find experts, applications, and professional services to meet their specific business needs—and build on the software they already have. At the same time, Pinpoint helps developers and technology service providers quickly and easily get software applications and professional services to market—and engage customers who need what they offer. Pinpoint is the largest directory of qualified IT companies and their software solutions built on Microsoft technologies. More than 7,000 software application offerings. More than 30,000 Microsoft-technology experts. The largest, most diverse set of Microsoft business platform offerings in the industry in a central location. Direct links between applications and the services that support them. Whether you’re searching for expert help or offering it, Pinpoint helps you easily find and engage the right people and technologies to get the job done. Microsoft Codename “Dallas” is Microsoft’s Information Services business, enabling developers and information workers to instantly find, purchase, and manage Web services and datasets to power the next set of killer applications on any platform. Dave Campbell, a Microsoft technical fellow, demonstrated Dallas at PDC. He showed a list of data provides from the partners such as infoUSA, subscriptions, the ability to store structured and unstructured data, and to explore the data without needing to parse it, to preview the data in ATOM, invoke the data as a Rest service and analyze the data using PowerPivot in Microsoft’s Excel spreadsheet program. Note my emphasis on the last sentence! Here at last is the ability to buy that third party data that’s been a part of every Powerpivot demo. I’ve worked with a lot of companies that sell data in my career, and this looks like it could be a very significant development for them. I’d even heard vague rumours that MS were interested in buying commercial data providers at one point, several years ago – if they were prepared to go this extreme then it would certainly go a long way to making this strategy a success. It’s not too late to register, even though SQLBits is only next week. It’s looking like it will be the largest event yet in terms of attendance… If you’re coming and you see me around, say hello! The PASS Summit is over for another year and I’m just starting out on the long trip back home, so there’s plenty of time to get my thoughts together on what’s happened over the past week. In fact there’s not much to say about the event itself: it was, as ever, a lot of fun and totally worthwhile. Hey, within 30 minutes of arriving at the conference I learned I’d won an award for the best BI-related blog entry, for my post on implementing real SSAS drilldown in SSRS! Attendance was up from last year although probably the recession still took its toll: remember that there was no BI Conference this year and I would have thought that a lot of people who would have gone to it would have gone to PASS instead. To be honest I think not having a BI Conference is a good thing, actually. I don’t like having to choose which conference to attend, and part of the benefit of a conference is to get as many members of a tech community together in one place. And this was certainly the largest gathering of Analysis Services people I’ve ever seen: all the usual crowd were there, I met a lot of people who I’d only met a few times before, and I finally got to meet Darren Gosbell in person after having known him by email for at least five years. One complaint I would make about the event was that the sessions weren’t scheduled particularly well. I know everyone always complains about this but in this case it did seem worse than usual: my session, for example, was up against two other SSAS-specific sessions, but in other cases there were time slots with no SSAS content at all. The other benefit of PASS is that you get to talk at length about what’s going on in the world of SQL Server with other like-minded people. As a result you get to crystallise your thoughts on a lot of matters and – guess what – I’m going to share mine here. First of all, the topic that was on everyone’s lips was PowerPivot. In fact everyone at the conference must have seen the standard demo at least five times and there were also a lot of advanced sessions on it too. Don’t get me wrong, I really think PowerPivot it cool from a technology point of view, I am going to take the time to learn it, and I also think from a make-money-by-getting-people-to-upgrade-to-Office-2010 point of view it is a very clever move for Microsoft. But my feelings about it remain ambiguous. Quite apart from the arguments about it discouraging ‘one version of the truth’ and encouraging spreadmarts that have already been discussed ad nauseam, I have another problem with it: I don’t honestly know whether I, as a consultant, will be able to make any money from it. The very nature of it, as a self-service tool, means no expensive outside consultancy is necessary. I don’t think it will take business away from me though; it will be widely used and it will be used instead of regular SSAS for more basic projects, but the more serious stuff will stay with SSAS I hope. I think the need for sophisticated security and more complex calculations will be the deciding factor when people choose between SSAS and PowerPivot; I’m not sure I see many people upselling from PowerPivot to SSAS either. We’ll see. Something that worries me more about PowerPivot is the fact that it seems to have diverted the attention of the SSAS dev team. For SSAS 2008 we had few new features, although the performance improvements were very welcome. 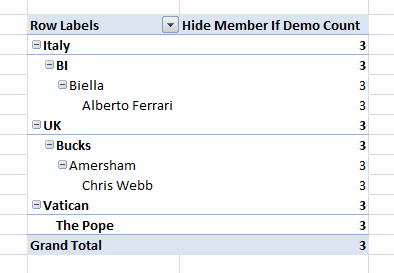 For 2008 R2 I can only think of one new feature in SSAS, and that’s the ability to use calculated members in subselects that will allow Excel 2010 to use time utility dimensions properly (I’ll blog about that at some point). Even though work on good old server-side SSAS will resume for the next major release of SQL Server I worry that PowerPivot will take priority in the future. If this happened it would be bad for me and other BI partners from a business point of view, and seems crazy given that SSAS has been such a successful product in the enterprise sector; it’s not like there aren’t a lot of new features and fixes that could be done. Shades of IE6 and Microsoft getting complacent once it’s cornered a market, I think. Last of all on PowerPivot, I suspect that there is something new relating to it in the roadmap that hasn’t been announced yet. David DeWitt devoted his keynote on Thursday to it, the specifics of column-store databases and the Vertipaq engine (which is the new in-memory storage engine that PowerPivot uses), and at the end hinted at this saying that although he couldn’t make any announcements, those people who had been paying attention might have some ideas on what the future held for it. Of course I hadn’t been paying attention properly, but the obvious thing would be to integrate it with the relational database somehow. Given that PowerPivot is now being hosted inside Sharepoint, why not host it in SQL Server too? 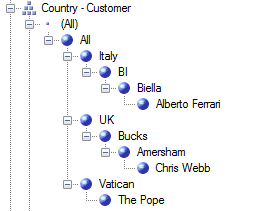 It’s already very table and join friendly, and I could imagine a scenario where it was used inside SQL, pointed at a schema, some kind of proactive caching kept the data in SQL in synch with the data in the Vertipaq store, difficult BI calculations could be expressed in DAX, but the whole thing was transparent to TSQL. Imagine integrating that with Madison too! Moving on, the other thing that has become clear to me is that I really have to sit down and learn Sharepoint (or at least the relevant bits of it) properly. It’s at the heart of Microsoft’s BI strategy and there’s no avoiding it. I have to admit to some mixed feelings about this move though, and I know other people I talked to at the conference share them. Partly it’s because, in the past, there were BI specialists and there were Sharepoint specialists and we didn’t necessarily have much to do with each other; now, though, the two worlds are colliding and I’m outside my comfort zone. You might say that Sharepoint has been part of the MS BI strategy for ages now, what with PerformancePoint etc, but I see an awful lot of MS BI customers in my work and I very rarely seem to see any Sharepoint, although it could be because I’m not looking out for it. A more valid objection is that the need for Sharepoint Enterprise Edition CALs adds a lot of extra cost to a project; and from a technical standpoint Sharepoint itself carries a very big overhead – its installation and maintenance may put a lot of customers off if they don’t already have a company-wide Sharepoint strategy, and if they do have one they may not be willing to go to 2010 for some time. Sharepoint might be just too big for some customers to swallow, and be a difficult sell for BI partners. I’d like to stress though, once again, that I see the considerable technical benefits for using Sharepoint for BI, and even if the reception of the latest wave of PerformancePoint has been somewhat muted (eg the realisation that the decomposition tree has been tacked on at the last minute and isn’t properly integrated) I am impressed with what’s coming with Excel 2010 and Excel Services too; for example I think the Excel Services REST API is very cool indeed, and as a SSAS client Excel 2010 is a big improvement on 2007 (which wasn’t all that bad either). I’ve decided I also need to learn Excel properly now as well – get to know all those advanced Excel functions, use Solver and all that. Once again two worlds are colliding: the Excel guys and the SSAS guys are going to have to learn a lot more about each others’ technologies for truly effective BI applications to get built. Anyway, I think this post has gone on quite long enough now. As always, your comments on everything I’ve written here would be much appreciated. Here are some notes from the SQLCat team’s session on SSAS consolidation and virtualisation; they’re a bit fragmentary since I’m too busy paying attention to what’s being said! I get asked about these issues by my customers all the time. Also since resource usage requirements for SSAS and SQL will be different when processing and when querying, if they’re on the same box you can use WSRM to dynamically change resource allocations at different times. Consolidating multiple SSAS databases on the same machine, it can be good to use multiple instances (maybe one per database) on the same machine to give fine control over resource usage, service packs etc. Someone asked the question of whether there is an overhead to using multiple instances each with one database rather than using a single instance with multiple databases. Answer: multiple instances would perform better but use slightly more resources; better to start with a single instance and only move to multiple instances when you have a good reason to do so. Tests run comparing SSAS running on bare metal and Hyper V – no difference in performance between the two for querying, but for the Storage Engine (processing and SE activity when querying) you use 1.5 times more threads on Hyper V (can modify the default number of threads available for processing, may therefore need to change this for Hyper V). Description of a custom-built system for load balancing SSAS developed by the MSSales team inside Microsoft. Code and white paper will be available in a few months. There were various issues with Synchronization in SSAS that have been fixed in the late CUs. IIS7 performs much better for HTTP access to SSAS – performs as well as a direct connection. I’m sure I also heard somewhere that there were some performance issues for HTTP access that were noticeable over a slow network that have also been fixed in the latest CUs. The most useful session so far at this conference for me – I learned a lot.